It occurred to me I haven't bothered you with my random thoughts for a while. Not that I had lack thereof, they just possibly were a little too random to make it into written word. I wrote this sentence with my toes, just to amuse you. So here's a thought I've been pushing around for a while. Are we on the path towards more or less rationality? The last several hundred years were marked by increased rationality: the rise and success of the scientific method, the Age of Enlightenment, the decline of religion and superstition, and so on. But you look around these days it seems that increasingly more people seem to be scared by the prospect. If you extrapolate that trend where will it lead us? Maybe there are just things we don't want to know. (See also The Right Not to Know). It seems to me there's a sentiment in the air that we need more "spirituality," more "magic," more "wonders" in our increasingly technological world based on mechanical engineering and computer algorithms. Some people want to "reinvent the sacred," others emphazise "emotional intelligence" or "the power of thinking without thinking." Blink. While I think some of these arguments aren't very insightful, there are two aspects I'm sympathetic to. For one, I think there is at any one time a limit to what humans can possibly know, possibly even a limit to what we can ever know and we should be more aware of that. That means for example instead of being scared by gaps in our knowledge it or discarding them as a failure of scientists we should recognize the relevance of acknowledging and dealing with uncertainty, incomplete knowledge and 'unknown unknowns,' as well as be vary of The Illusion of Knowledge. Now let me step away from the human brain and consider instead of a system of neurons the systems that govern our every day lives, like for example our political systems. They have some "rational" processes to deal with input and to decide on actions. They also have some emergency shortcuts resembling unconscious reactions. If somebody throws a pillow at you, you'll raise your arms and close your eyes without a long deliberation of whether or not that's a good thing to do. If somebody throws a bomb on your territory you don't want to get stuck in endless discussions about what to do. But what about intuitions and emotions? Where is the space for them? Mike Garner: Yeah, and loan officers would have an accountant they could call up and say “Can you write a statement saying a truck driver can make this much money?” Then the next one, came along, and it was no income, verified assets. So you don't have to tell the people what you do for a living. You don’t have to tell the people what you do for work. All you have to do is state you have a certain amount of money in your bank account. And then, the next one, is just no income, no asset. You don't have to state anything. Just have to have a credit score and a pulse. Alex Blumberg: Actually that pulse thing. Also optional. Like the case in Ohio where 23 dead people were approved for mortgages. Well, so much about rationality. The point is it's not that people didn't feel there was something wrong. It was just that the system itself had no way to address that feeling. The negative feedback it could have provided went nowhere. Or take the academic system, one of my pet topics as you know. It's not that people think it's all well and great. In fact, they can tell you all kinds of things that don't work well and some can complain seeming endlessly. But the system itself has no way to address these concerns. The only way to improve it is external intervention, which however usually only takes place once things go really wrong. It's like you go out with a guy and even though you don't know exactly what's wrong, he makes you feel really awkward. But instead of just stop dating him you'd go see a shrink who looks up in a book what you're supposed to do. That's about what's wrong with our political systems. So what's the future of rationality? I think we'll need to find its proper place. Aside: I believe that many of the arguments we have about rationality are based on a lacking definition. For example if I intend to buy a new gadget I will typically look at the first few offers and pick the one I like best, finito. Sure, if I had looked a little harder or a little longer I might have saved some bucks. But frankly I'd rather pay more than spending an infinite amount of time with customer reviews. I think this is perfectly rational. Others might disagree. (And now encode that in your utility function.) That is to exemplify that rationality might not easily be objectively quantifiable. Just consider the amount of different networks woven through your life: there's the route maps of airlines, the internet and its virtual link-structure, the world wide web (for example the blogosphere), the production and distribution processes of consumption goods, electricity networks and, of course, the sexual networks. And though they are different in many aspects, they share a similar underlying fundamental structure that can be mathematically captured and analyzed. Needless to say, with our rapidly improving capacities for storing and handling large amounts of data, the study of networks has flourished tremendously within the last decade. 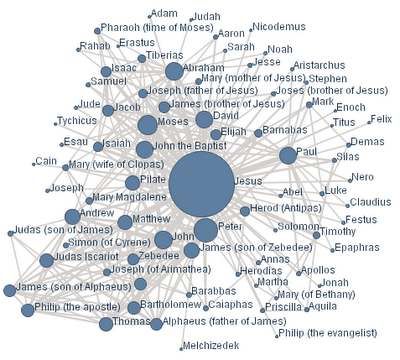 Pictorially speaking a network is a collection of dots connected by lines. Physicists tend to call the dots nodes and the lines links, mathematicians call it a graph with vertices and edges, but it's the same thing really. The number of connections a dot has is also called the 'degree' of the node or, if you prefer, the 'valency' of the vertex. The great beauty of networks is their generality. From such a simple mathematical description one arrives at a great variety of structures and phenomena. The links between the nodes can just be connectors that are on or off, or they can be arrows indicating a preferred direction, called a 'directed graph'. Links on websites for example have a direction, friendship networks on Facebook don't. Both the nodes and the links can carry information, eg about what is produced in the nodes or transmitted in the links. Random: A random network is one in which from a collection of nodes pairs are picked randomly and connected. Scale free: A scale-free network is one in which there is a specific relation between the number of nodes and their degree, called a 'power law'. In these networks, there are a lot of nodes with only a few links, and a few nodes with a lot of links - these are also called 'hubs'. Real world networks, eg the www or airline networks, turn out to be often scale-free (to some approximation) with consequences for their robustness and vulnerability e.g. the spread of viruses or the dissemination of information. Other important information in a network's structure are highly connected clusters with sparse connections (gaps) between them (there are different algorithms for their identification), and flows around loops. Particularly interesting are growth mechanisms and phase transitions that can occur with that growth. So why am I telling you that? Because the analysis of networks can help us to understand many aspects of the inanimate and animate world whose interdependence obscures local analysis. In particular, the growth of specific structures and the dynamical properties of networks play an increasingly important role for managing large scale effects. Understanding the conditions necessary for resilience - may it be of a social, economical or ecological network - is essential to ensure stability of these networks that are vital parts of our lives. While my enthusiasm about "complex systems" is limited due to the vagueness and ambiguity of a lot of of this research, network science is its backbone. Needless to say, there is some overenthusiasm also in this area. One thing I would like to know better for example is what the limits are of modeling systems as networks. With enough abstraction, I can probably describe everything as some sort of graph. But under which circumstances is that insightful? This post was inspired by last week's colloquium by Raissa D'Souza from UC Davis on "Growing, Jamming and Changing Phase" that you find on PIRSA 09050004. In the comments thread of the post, a question came up I hadn't thought about before: How comes that an interference pattern can be seen in the first place, given that the source of light looks white? After all, the broad spectrum of wavelengths from a white light should result in the superposition of the interference patterns for each wavelength, and a thus in a blurring of the fringes. One reason for the appearance of the interference pattern is the spectrum of the street lights I had photographed: It is not a broad and continuous spectrum, but has a few bright lines. On the other hand, as I could convince myself, even for a broader spectrum, there is enough contrast between the main central spot and the satellite spots of the pattern to be clearly distinguishable. where α is the angle away from the optical axis. 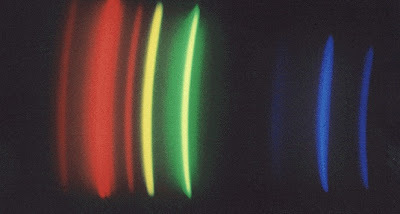 The first fraction is the profile of the diffraction pattern for one slit, and the second fraction is the two-beam interference. The grey curve gives the sum of the intensities for the four different wavelengths. One sees that the pattern gets tighter for shorter wavelengths, and that, as a result, the satellite peaks are broadened. However, there is still enough contrast between the central maximum and the first pair of satellite peaks for the fringe pattern to be visible. All further peaks, on the other hand, will be washed out. Now, to obtain the diffraction pattern of the street lights, one would have to sum up the diffraction patterns for different wavelengths, weighted with the spectral density of the mercury vapour lamp. There is enough contrast for the three fringes of the interference pattern to be distinguishable, and even for the solar spectrum, one could expect sufficient contrast to see interference. One final question, however, remains: According to the plot of the diffraction pattern for different wavelengths, one could expect that the satellite peaks look coloured: more blueish on the side towards the inward peak, and more reddish on the outside. However, in the photo, above, there are no colours. How comes? My guess is that this is due to the pixel resolution of my camera. Actually, what is recorded on the chip of the camera is the convolution of the diffraction pattern with the pixel characteristics of the CCD chip. One pixel of the photo corresponds to an angle of about 1/2 arc minute, and the peaks are about two arc minutes wide, corresponding to four pixels. This binning is too coarse to clearly distinguish colours, and hence, also the satellite peaks do look white. After a two year break, Princeton University has been hosting a new "Art of Science" competition this year with the theme of "found art." The organizers explain on their website: "These extraordinary images are not art for art’s sake. Rather, they were produced during the course of scientific research. Entries were chosen for their aesthetic excellence as well as scientific or technical interest." You find the submissions and winners here. Beautiful. Martin Fenner reports on the results from his survey on author identifiers, a topic that we discussed on our post Yes, but are you a prime number? Videos a little weirder: Check Yooouuutuube.com. (Thanks to Andi!). If I were to dig a hole right here and through the center of the Earth, where would I come out? Somewhere in the Indian Ocean, Southwest of Australia. Dig your own hole here and tell me where you come out! As you know, I will be moving to Sweden this fall, thus I am presently looking for a new apartment in Stockholm. Next to browsing advertisements, I thought it a good idea to post a note myself asking for offers to be sent to me. While I know my way around with moving, I hadn't tried posting an ad before, and so used the first site that came up in a Google search called "Craigslist". Within a week, I had at least 10 offers, all of which made me feel uneasy for different reasons. By now I've convinced myself they are all scams. The following report might not be so interesting for our frequent readers, but I want to share my (depressing) experience here with some useful links to online repositories dedicated to scam busting for those random visitors who might ask themselves the same questions. to Stockholm about December so you can rent until then..
"If you mean with 'reservation' I'm supposed to blindly send money to somebody who just happens to have sent me an email, you'll have to look for somebody more stupid. For all I know you might not even own the place. Best -Sabine"
I work as Volunteer with a Non Governmental Organization in West Africa,Nigeria.The apartment will cost 4000 SEK per month including utilities.A 55sqm apartment which has just been refurnished,and situated in a very safe area ideal for families. The fully equipped, separated kitchen is brand-new and has all kinds of kitchen implements that you may need.The bathroom is fully equipped with a bath tub, shower, wash basin, bidet and toilet.For your safety the apartment is also equipped with a reinforced door and a safe box, where you can store all your valuables. A perfect place to stay for anyone interested in good food, night life and sightseeing.The apartment also has WI-FI Internet service,telephone service, electric oven, microwave, washing machine, refrigerator and a spacious parking garage. Subject: Re: SEK10000 Looking for Apt Sep 1st 2009.. YOU GOT ONE ..
contract ,the details are below. I am in Italy now Planning a wedding ceremony. I will send my picture in the next mail.Thanks i await for your response. (I left out some irrelevant details.) I checked all the street addresses, they do exist. However, at this point I had gotten very suspicious of all these offers and I did a Google search for "Craigslist Rental Fraud" which turned up more than 200,000 results! Apparently rental fraud has taken off within the last year. There are lots of reports from people who got cheated on either when replying to a posted ad, or when getting offers after posting an ad. I read a lot of sad stories, many of which started with an email like the ones I received. Searching Wordpress for the tag Craiglist Scam also give you a sense of what's going on. I deleted my ad from Craigslist to avoid getting more of these emails. After some searching, I found the following very useful websites that list a lot of examples, as well as names, email addresses and phone numbers that are being used for the scams. Most notably there is a blog called Here be Dragons. On this list for example there appears "Matilda's" phone number as well as the "easygoing wedding planner" in an email with exactly the same wording that I got, just that her name is "Angelique" instead of "Leyla" and the alleged apartment in Geneva instead of Stockholm. Another useful repository is a blog called Let's Get the Craigslist Scammers. The story with the mission worker in West Africa seems to be particularly common. I also found out that a lot of the scams come from Nigeria. Thus, I checked on the IP address of the only offer left that didn't reproduce any of these known stories. A person claiming to be "Ruth Star" living in the UK who has to go and ask her dad for advice after every mail (since I annoyingly keep refusing to send money). In contrast to all the other emails, the English is okay in this case. Turns out however the sender's IP address is located in, guess what, Nigeria. Amazingly enough, she sent me a photo of a British passport (allegedly her dad's) which makes me wonder whose passport this might have been. The photo isn't particularly good though, it's hard to tell whether the name has been edited or not, but the background looks quite authentic. Anyway, though luckily I didn't send money to any of these scammers and all I've lost is time, the sheer abundance in which these scams are apparently tried depressed me quite a lot. What makes people try to earn their living by ripping off others? Meanwhile, I am still looking for an apartment in Stockholm. If you happen to know somebody who knows somebody who knows somebody... please send me a note. 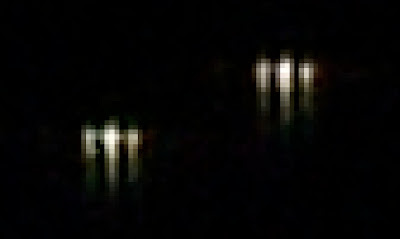 There is the roof of a parked car in the foreground, and a bright street light about 100 metres away. The dimmer white and blueish lights are street lights on a hill, about 1 kilometre away, and the yellow lights are illuminated windows. The two slits are a bit less than 1 millimetre wide each, and separated by a bit more than 1 millimetre. There is less light entering the camery, so the photo is darker. But wait: The distant street lights now show a very clear interference pattern! Instead of one spot of light, there are three distinct fringes. This startling little experiment demonstrates the principle of interferometry, as it is used in astronomy to measure the diameter of stars, for example. Actually, I got the idea of the experiment from the chapter Basic concepts: a qualitative Introduction in Labeyrie, Lipson, and Nisenson's An introduction to optical stellar interferometry. The double-slit aperture is shown in black, the lens system of the camera in grey, and the CCD chip in blue. The camera is focussed "on infinity", which means that parallel rays of light are bundeled onto one spot on the chip in the focal plane. This is shown for the two yellow rays of light, which may hit the camera from one of the distant street lights. So far, this is all geometrical optics. But as we know, light is a wave, and the aperture creates the situation of Young's double-slit experiment: According to Huygens' principle, each point of the two slits can be considered as the origin of a spherical wave, which, at a distance, combine again to plane wave fronts. But now, there will be not only the wave front in the direction of the incoming light rays, but also additional, slightly deflected wave fronts. In all these deflected wave fronts, the path difference Γ has to be an integer multiple of the wavelength, λ. The deflected waves will also be focussed on one spot by the lenses. This is shown by the dotted orange lines. In the experiment, there is one clearly visible extra spot on each side of the central spot, meaning that Γ, shown in lightblue, is just one wavelength of visible light. The angle α between the the two spots is easy to calculate – it is (in radians) just the wavelenght of light, λ, divided by the distance d of the two slits: α = λ/d. Taking for simplicity λ ≈ 600 nm = 0.6 µm and d = 2 mm = 2000 µm, this is α = 0.0003 ≈ 1' arc minute = 1/60°. There is an interesting twist to these considerations: When the angular size of the light source is bigger than the angle α, one cannot expect to see the interference pattern, because the image of the source in the focal plane is already as big as the distance between the spots. So, at a distance of, say, 100 m, the light source should be smaller than 0.0003 · 100 m = 3 cm for the interference pattern to show up. A typical street light is bigger than that, hence, there is no interference pattern visible for the nearby street light. However, for a distance of 1 km, the light source will show the interference fringes if it is smaller than 0.0003 · 1000 m = 30 cm – and this condition is fulfilled for the street lights on the distant hill! The French physicist Hippolyte Fizeau has suggested in the 1850s to use this method to determine the angular diameter of stars: Spotting a star in a telescope with a two-slit aperture with a small distance beteeen the slits, one would expect to see interference fringes, as stars are very much point-like sources of light. However, increasing the distance between the slits, the critical angle for the loss of the interference pattern shrinks, and from the distance of the slits when the interference pattern disappears, one can calculate the angular diameter of the star. Edouard Stéphan, astronomer at the observatory of Marseille in France, was the first to put this method in practice, but he always saw interference patterns: He only could establish upper bounds on the angular size of stars. The first successfull application of the method was by Albert Michelson and Francis Pease in 1920: They could measure the diameter of Betelgeuse, the bright red star in the constellation Orion. It is 0.05 arcseconds, or the size of a street light in a distance of 1250 km. For such measurements, I'll need better equipment. Basic concepts: A Qualitative Introduction in Antoine Labeyrie, Stephen G. Lipson, Peter Nisenson: An introduction to optical stellar interferometry. Edouard Stéphan: Sur l'extrême petitesse du diamêtre aparent des étoiles fixes. Comptes Rendus de l'Académie des Sciences 78, 1008-1012 (1874). Albert A. Michelson, Francis G. Pease: Measurement of the diameter of alpha Orionis with the interferometer. Astrophys. J. 53, 249-259 (1921). Is 1 = 0.999999... ? Searching in what was left from my 6 semesters maths I said I think so, upon which the guy looked disappointed. I figured it was the right answer - right at least for my purposes. We then had a pleasant conversation about graphic cards I believe. Anyway, recently this question crossed my path again. It seems to have some eternal fascination, so let me just offer my take on it. The left side is the limit for n to infinity of the sum over 9 x 10-m from m=1 to n. The limit of this sum for taking n to infinity is one, according to the most straightforward proof you can think of, namely if you pick any number only an epsilon smaller than 1 there will always be an n0 such that the sum is closer to 1 than that number for all larger n. Thus, both are equal. You find a furious discussion of the topic here. This post was created by random association to Mark's post You can't write that number; in fact, you can't write most numbers even though you can write that number. Wishing you all a good start into the weekend! PS: As was pointed out in the comments, Wikipedia has an excellent site on the matter. 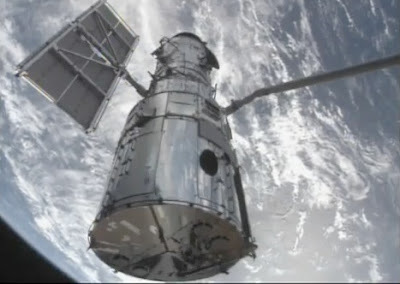 This is an exciting week for those of us taking interest in astronomy and astrophysics: Today, the Hubble Space Telescope has been grappled by the robotic arm of Space Shuttle Atlantis, to be checked and repaired over the next few days by NASA astronauts, and tomorrow, an Ariane 5 rocket is to lift into orbit the European satellites Herschel and Planck. Herschel is an infrared telescope, with the largest mirror so far in space, and Planck will take precision measurements of the cosmic microwave background. Both telescopes will be placed near Lagrange Point L2. While we are fascinated by the data and photos gathered by space probes like Hubble or WMAP, it's easy to forget that the technology behind these missions is complex, and can fail. The service mission to Hubble had been postponed and temporarily cancelled in the wake of the Columbia disaster, and still now, Space Shuttle Endeavour is ready to lift off for rescue in case Atlantis gets in trouble. In February this year, NASA lost the Orbiting Carbon Observatory satellite following a rocket malfunction. The Ariane 5 rocket has failed completely twice in 43 launches, and missed to bring its payload in the right orbit on another two occasions. I was wondering why the decision had been taken by ESA to pack both Herschel and Planck on one rocket, putting both eggs in one basket. 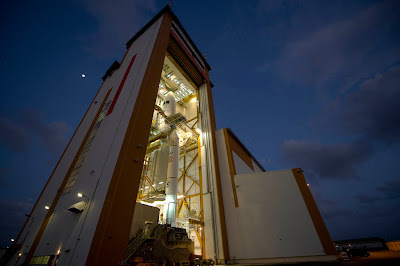 But it seems the Ariane is constructed to lift two satellites, launches are expensive, and so far, there is no need for commercial satellites to be parked at Lagrange Point L2. So, I'll keep my fingers crossed tomorrow afternoon. Update (14 May): ESA has set up a live web streaming of the Herschel-Planck launch starting at 14:40 CEST/12:20 UTC. The launch itself is scheduled to take place at 15:12 CEST/13:12 UTC. Update (14 May, 16:00 CEST): Congratulations! All went well so far: Herschel and Planck have been detached from the carrier, and are sending signals. Now, to the Lagrange point. The transfer takes about two months. NASA site of the Hubble Service Mission "Mission to Hubble – Making Hubble More Powerful Than Ever"
"Planck scientist" Andrew Jaffe is blogging from the Herschel/Planck launch in Kourou, French Guiana. My most lasting impression is that there is a growing field of research, which is at a stage where it could advance rapidly. Good work has been done over the last several decades, which has given us a store of results, hypotheses, conjectured laws and principles, methods etc which provide a good foundation for continued work. But much remains to be done before there can be a claim that these results add up to an approach to economic theory and modeling that can take over from the neoclassical paradigm as the foundation of economic theory. To say that there is a field of research is not the same as saying that there is a theory or approach that everyone agrees on. Quite the opposite, what we saw was several distinct strands of thought, each with their own methodology, some of which were meeting each other for the first time. There is no consensus about the right way to approach economics out of equilibrium, even among those who take this as their goal. Even within approaches that share a common methodology, such as agent based models, we saw at least three very different frameworks based on different philosophies as to how agents are modeled and what the aim is. What makes it possible to group these diverse projects within a single field is so far only that they share a common aim, which is to develop an approach to economics which is dynamical and capable of describing markets out of equilibrium. For this goal to succeed it is not necessary that these directions become part of an eventual successful theory. But at least some of us suspect that there are latent and possibly important relationships between some of the directions, such as agent based models, insights from biology and the gauge theoretic approach. If this is right then there is a great deal to be gained from cross talk and collaboration amongst these approaches. What should this field, which aims to be go beyond the study of equilibrium economics, be called? The term econophysics is useful but not general enough as we are not all physicists. Leigh Tesfatsion uses the term “non-equilibrium dynamical model (NED).” One possibility would be to shorten this to dynamical economics, as dynamical implies that it can encompass both non-equilibriium and equilibrium. Another alternative is nonequilibrium economics, but this recalls the confusion between physicists and economists notions of equilibrium, due to the suggestion that the economists notion of equilibrium may correspond to a physicists’ notion of non-equilibrium steady state. Dynamical brings to mind the neoclassical conception of equilibrium as analogous to a static balance of forces. It encompasses everything having to do with the dynamics of an economy, ie with evolution in time. This includes agent based models and the gauge theoretic approaches. The biggest question that I am left with from the conference is whether there can be unification or at least cross talk amongst different approaches that could be so characterized. A possible route to this would be a unifying idea. Here is a candidate for one: the notion of path dependence in economic dynamics. This comes from the ecological and complex systems approaches to economics, as cycles are central to those programs, through Morowitz’s 1968 cycle theorem. We saw evidence for the importance of cycles in Kelly John Rose’s presentation and there were hints of it in some of the discussions of agent based models. Path dependence is also the central idea of the gauge theory, as discussed by Pia Malaney and Eric Weinstein. The key insight of the gauge theory approach is that evolution of a market in time is generically path dependent, as a consequence of embodying in the mathematics the decomposition of a history of a portfolio or inventory into components of substitution, during which value doesn’t change, and growth, during which it does. This is the definition of what mathematicians call a connection. The efficient market hypothesis characterizes equilibrium as equivalent to path independence, which is in turn related to no-arbitrage. Hence, the evolution out of and fluctuations around equilibrium are path dependent, hence they are measured by what mathematicians call curvatures of the gauge connection. That is, in a gauge system the observables are connected with cycles; what they measure is path dependence around closed curves. This way of looking at it suggest that gauge invariance is a deep notion that underlies the dynamics of economics out of equilibrium, but the proof must be in what results this leads to. Could the notion of gauge invariance be helpful for agent-based approaches? This is a step towards investigating the power of the notion of path dependence. This has been the particular interest of our small PI effort, with Sam Vazquez, Simone Severini and others, and what we have found is that gauge invariance can be imposed on agent based models and it helps to constrain the freedom in the choice of dynamics and point to interesting observables for measuring departures from equilibrium. Big questions remain such as whether the gauge invariance should be fundamental, or should be emergent, say when price discovery happens. Main goals of this field. Develop a new theory of economics which extends neoclassical economics by discovering principles and laws which govern the dynamics of economies and markets. Build a suite of toy models to illustrate and test these principles. These will be primarily agent based models, but they will be supported and checked by various analytic approximations. Build a family of increasingly more realistic models to be compared to real markets, against real data. This is the goal of the test-bed that Leigh talks about. Develop a common format and language for both the toy and more realistic models and make them modular and open source, so that different researchers and groups may contribute their own ideas and models within the overall project. Develop a family of data sets which can be used to test models against, and make them available in a common format for download from a project web page. It would be good if this data set encompasses several if not many countries as well as as long a time span as is practicable. As Danny Goroff emphasized, the construction, formatting and maintanence of these data sets are major efforts in themselves. Another point, raised by Sabine Hossenfelder, is that it would be very good to develop visualization tools to help in working with the data sets. Finally, integrate these newer approaches to economics with neoclassical economics, as the former, to the extent that they succeed, represent a deepening of the latter and are built on it rather than in opposition to it. These goals are interconnected and it is likely that major progress in any of them will go hand in hand with progress in the others. A great deal has been done with agent based models, and, as Doyne Farmer emphasized, some laws and hypotheses are known. But I don’t think it is the case that there is yet a principle based theory of the dynamics of economics on the same level of robustness and canonicalness of the neoclassical theory of economic equilibrium. A final way to seek to connect approaches is through common questions, so this is my last list. Here are the issues we wrote down on the board during the last morning as well as some which have been mentioned or occurred to me since. I would invite others to contribute their own. What is the important data to explain/match? Where can it be found, how easy is it to get? Does there need to be work to define data sets and make them available online in specified formats? Can we specify the minimal elements a model must have to be considered an “in principle” model of a market or an economy. Can we specify the minimal elements a model must have to have the possibility of modeling a real world modern economy? Can we define a framework, test-bed, set of protocols etc to define a class of economic models to allow them to be interchanged and developed efficiently? What are the observables of an economic model? Are there unobvious observables? Are all the things in models genuinely observable? Are there non-obvious observables such as those associated with cycles? Is it a problem that many economic models/theories have elements such as utilities that are not observable? The notion of gauge invariance strongly constrains the choice of observables in physics, will it play a similarly powerful role in picking out the observables of economics? What is the role of unobservables in economic models, such as utilities? Can models be constructed without them? Or, is there a necessary place in the model to represent the large variability in how real people and corporations make decisions, which are not readable off the economic data? That is, is it possible that the utilities represent factors that are and will remain unknown to the theorist that do influence market decisions? The goal of an economic theory and models may then be to understand and model a system, within the constraint that a component of the causes for decisions are unobservable to the modeler, because they are in the heads of the people involved? What are the goals of economic modeling? Given Taleb’s point that we cannot hope to predict unusual events that have strong influence on markets, are there still questions that can be answered and patterns that can be found and understood? Can we investigate questions such as how to construct more or less stable markets, or possible tradeoffs between rate of growth and stability, without being able to predict exactly how a market will evolve? What is the role of cycles in economic models? How relevant is Morowitz’s cycle theorem? A common theme of diverse approaches to non-equilibrium economics is path dependence. This arises in cycles in models of complex economies, including Kelly John Rose’s model of the US economy, it is also the key point in the application of gauge fields to economics. Is the role of cycles and path dependence a key insight which provides the basis for a unification of these diverse approaches? Would it be interesting and novel to develop agent based models of trade among many countries? What questions could such models investigate? Would it be good to see if a dynamical economics approach could confirm or correct the principle of comparative advantage? The role of innovation, technological development etc, appear to offer opportunities and challenges for theories of economics. They are good challenges because innovation is at the same time central to economic growth and impossible to predict in detail. To what extent is market regulation a computer science problem? Given that all the major markets are instantiated in software and run across computer networks, can we conceive of the goal of stable markets, regulated as well as designed to be self-stablizing, which contribute to economic growth without being parasitic on it, as a design problem in computer science. Could we make use of experience computer scientists have of designing stable, dynamic networks? Can we give meaning to the slogan, “economics is the continuation of natural selection by other means”? One hypothesis is that when accounting is invented there comes into existence a new entity, called the economic agent, which the books refer to. Whether this is an individual, family or a firm, it has specific existence and properties by virtue of the fact that books are kept of its activities. Is it possible that this economic agent defined by accounting becomes a unit of selection? Can we define a sufficient set of characteristics, which define human behavior in market situations to design agents which are realistic mimics of human agents? On the other hand, are there questions about markets for which the answers involve appeal to a universality class of models, where all or most of the specification of properties of agents become irrelevant? To put this differently, can we distinguish the relevant from the irrelevant parameters in microscopic models of agent interactions? There seem to be two very distinct ways in which biology and evolution enters the discussion of economics. One, as a better understood example of a complex, self-organized system, from which ideas and strategies for economics have been drawn. Second, as a source of knowledge about how real human beings behave within markets. There does not appear to me to be a strong relation between these two claims for the relevance of biology to economics. Is this a problem? Several times in the discussion there appeared evidence that in the real markets, at least recently, the majority of traders occupy a small number of positions in the spaces of positions and strategies. This point was made by people with experience in the markets, as well as by Sasha Outkin and Mike Brown in their discussion of the NASDAQ model. This appears to contradict the efficient market hypothesis, which holds that the market embodies all the information available to it in prices because all possible positions are taken. It is only if positions are held on all sides that equilibrium, in the sense of a static balance of opposing forces, can obtain, in a high dimensional space of products and prices. It is also only if a large number of strategies have been covered that arbitrage can be eliminated. If this it is really the case that a very small number of positions dominate markets, is this characteristic of dangerously unstable or overleveraged markets, or a general characteristic of metastable equilibria which is not captured by the efficient market hypothesis? What are the next steps for developing this research program and field? The talks of this conference have been recorded and can be found in the PIRSA Collection C09006. Other reports on the conference: Barkley Rosser from EconoSpeak: Do We Need an "Economic Manhattan Project"?, Steve Hsu from Information Processing: Economics, ant farmers and free will theorems, and some photos here. The Frankfurter Allgemeine Zeitung had an article "Die Vermessung der Krise" by Jordan Mejias who reported on the meeting. You can find an English translation on Edge here. Related postings on this blog: The Trouble with Economics, Assumptions and Limitations, Science and the Economic Crisis, This is Your Economy on Drugs, When Capitalism Fails, and the Recession Playlist. In case anybody recalls, there was a presidential election going on last year. One couldn't open a newspaper, switch on the radio, go for a coffee without hearing "Obamaobamaobamabama." The absolutely last thing I wanted was to read a book by this person. But then it hunted me down in form a Christmas gift from my mother, "The Audacity of Hope," in my mailbox. Okay, so I read it. After all, the guy is now president and he smiles friendly from the cover. What is there to say? It's an entirely flawless book. Neatly organized into 9 chapters -- Republicans and Democrats, Values, Our Constitution, Politics, Opportunity, Faith, Race, The World Beyond our Borders, Family -- covering every sector a politician should have an opinion on, sprinkled with anecdotes, personal stories and reflections, it is an easy read, entertaining and interesting. The book is so good it is disgusting. One has to hate it. It feels as if one thousand PR agents went over it and sanded out all edges. Doesn't the guy have any vices, doesn't he have any regrets, didn't he make any mistakes, doesn't he have anything provocative to say at all? Can somebody be so smoothly intellectual and considerate and indeed be real? Here is the only upsetting sentence I could find: "[T]here will be times when we must again play the role of the world's reluctant sheriff." Unfortunately, this sentence is only outrageous when quoted out of context since the rest of the chapter provides a perfectly reasonably 21st century view on foreign politics. The guy is neither a dumb pacifist nor eager to convert the rest of the world to Americanism. What I liked best about the book has however nothing do to with it largely overlapping with my political views. No, it is that it communicates that politics is done by humans for humans, that arguments can be approached from an intellectual rather than a personal point of view, and that one can disagree with somebody without declaring that person an enemy. And it describes how the media by and large grossly distorts this process, amplifying and exaggerating differences to everybody's disadvantage. "[T]oday's constitutional arguments can't be separated from politics. But there's more than just outcomes at stake in our current debates about the Constitution and the proper role of the courts. We're also arguing about how to argue -- the means, in a big, crowded, noisy democracy, of settling our disputes peacefully. We want to get our way, but most of us also recognize the need for consistency, predictability, and coherence. We want the rules governing our democracy to be fair." "[W]e must test our ideals, visions, and values against the realities of a common life, so that over time they may be refined, discarded or replaced by new ideals, sharper vision, deeper values." If I translate that into my usual, considerably less eloquent, style: We must ensure our systems allow not only for variation, but also evaluation and following adaption so we remain able to learn and improve. The world is changing and we have to change with it. About the devastating backlash it can have on our democracies when influence is weighted by wealth, Obama writes "[T]hose who use their economic power to magnify their political influence far beyond what their numbers might justify [...] subvert the very idea of democracy." Well said. Unfortunately, he remains vague on what to do about it. A general criticism is that with his elaborations on all these topics he doesn't set any priorities. It is all well and fine to have high goals and visions about everything, but where to start? What is it that he finds most important? If you were president, what were the first thing you'd do? Also, the chapter about religion strikes me as somewhat odd, but then it seems to be a big deal in the USA. And one issue I found completely missing is what appears funny about American elections to most outside observers: it is essentially a two party system. I don't think this is a good status and a point that would have merited a sentence or two. Altogether, I guess the book is as good as a book from a politician can get. I find it neither particularly inspiring nor insightful, but I learned something about American history and politics. If this was an Amazon review I'd give four stars. One lacking because of leaving me nothing to complain about. The APS April meeting was in May. Is that an indicator for climate change? I squeezed in the trip to Denver, as previously mentioned, to give a talk about 'Phenomenological Quantum Gravity' and to be on a panel discussion about women and minorities in physics. The meeting took place at the Sheraton Downtown Denver - not exactly the class of hotels I usually stay in. It's the kind of place with guys in fancy uniforms at the entrance that insist on taking your bag, and with an army of service personnel that probably help you with anything your heart desires to make your stay more pleasant - if you speak Spanish. The room had a huge LCD screen. But no mini-bar. Maybe I shouldn't have used the groupcode from the APS meeting. The plenary session on Tuesday morning was quite interesting. First thing in the morning, Paris Sphicas gave a short pep-talk on LHC physics and the current schedule. However, I think you are better up-to-date by reading Peter's blog. Sphicas further talked about some early data analysis that had been done with cosmic rays and from last year's first cycling of the beam. What I gathered is that the detectors work well and everybody is excited about moving on. The next talk was by James Cronin, winner of the Nobel Prize in Physics 1980 (for the co-discovery of CP violation in the kaon system). He talked about the Pierre Auger Cosmic Ray Observatory and new data that they had (some of which he apparently wasn't supposed to show). It seems that with more events and better statistics the correlation between active galactic nuclei and the sources of cosmic rays - on which I reported here and more details here - has become weaker, and the distribution of cosmic rays looks more isotropic now than with the first measurements. The last plenary talk of the day was by Raymond Fonck about progress in understanding and managing plasma turbulences and the ITER project. I think it is one of the most relevant topics in physics one can presently work on. Power generation from nuclear fusion has the potential to become the energy supply of the future. However, even if we finally manage to deal with it, it will take too long to make the technique practicable to help us with the energy problems we are currently facing, so it's certainly not the only thing we should be doing. The session in the afternoon that I was speaking in was chaired by Vicky Kalogera from Northwestern University. The first talk was by Andrea Lommen who spoke about detecting gravitational waves with pulsars. The idea is that the signals received from pulsars have a reasonably precise timing over many years, and distortions of the background geometry through gravitational waves - generated eg by a nearby black hole merger - might affect that timing and become measurable. I was distracted and quite impressed by her body language, wondering where one can take a class to dance the figure of the rotating pulsar. It turned out later she had previously been a professional dancer. My talk was a brief summary of various ways to approach the challenging problem of measuring effects of quantum gravity. While I didn't have time to go into details I hope I managed to provide a sense of how the field is developing. The questions afterwards were really interesting. Even though it wasn't content of my talk, we were discussing Craig Hogan's "Holographic Noise" for a bit, and I was relieved to hear that the audience seemed to share my scepticism (see earlier post for details). The last talk in the session was by Steve McGuire about material science in the LIGO experiment, followed by a panel discussion in which the three speakers introduced themselves and we spoke for a while about our different experiences with making our ways in science, then taking some questions from the audience. It was both more interesting and more useful than I was afraid it would be, for discussions about minority questions have a tendency to heat up quickly. Instead, it was a very constructive exchange that showed there are many different paths one can take and options one can use and that after all what matters is your dedication to your work and how much you love science. It's good to be reminded of that occasionally and I am glad I went to the meeting. Last week I went to Howard Burton's talk at the Graduate Student Research Conference at the University of Waterloo, assuming he'd be speaking about his book that I just finished reading. Instead he gave a motivational talk about graduate school, supposedly "The Best Years of Your Life." While I have to say calling my years as a graduate student the "best years of my life" is a somewhat overly romantic memory, what I remember well is that one can always need motivation, thus today a feature for our younger readers. Howard started with the overarching question "should you be here (in graduate school)" by asking the audience "If you won the lottery and would never have to work for money would you still be here?" and if the answer to that question is not a convincing "yes" then get out. I like the approach, though I have my reservations. Fact is, a substantial amount of people make their PhD as a job qualification and not to continue in academia. Just two weeks ago the European Commission released the results of a new survey which (among other things) asked students about the significance of the role of higher education in: ensuring employability; enhancing personal development; and educating people to play an active role in society. They find that all three of these factors were considered to be important by a large majority of respondents: 97% of students believed it was 'very important' or 'rather important' to provide students with the knowledge and skills they needed to be successful in the labour market, 91% agreed that the enhancement of personal development was very important or rather important, and 87% of respondents considered that the education of people to play an active role in society was an important aim of higher education (PDF here). Thus, I'd think it's fine if you'd leave if you won the lottery but aiming for tenure probably isn't for you. I don't want to work on fashionable topics. My supervisor is a(n) $#@&%! Not being smart enough is not an excuse. We recently discussed the question how important is talent? I believe that talent is generally overrated and hard work underrated. You just do what you can and do it your own pace. If you don't want to work on fashionable topics, well, then don't. If your supervisor is really unbearable then get a different one, otherwise just grin and bear it. Consider that one day you'll be in his position and can shove around poor graduate students. If you think you don't have enough time, folks, it's not getting better than this. Howard is right on this point. I used to think I never had time to finish anything because constantly somebody wanted me to attend a seminar, or give a seminar, or to write proceedings, or I had to grade student's exercises, or I had to go for a coffee. Especially those coffees took up a lot of time. These days the most quiet time to think I find on planes. And I'm not even teaching! I secretly believe with tenure you get a little time-machine like the one Hermione uses in 'Harry Potter and the Prisoner of Azkaban' so you can squeeze in 30 hours into a 24 hour day. The last point, Howard said, is the only one to be taken really seriously and so he elaborated on it in more detail. Yes, you don't know very much. This feeling of not knowing enough isn't going to vanish. In fact, the more you learn the more you will realize how much more there is to learn. I find this occasionally frustrating, more frequently humiliating, but one has to live with it. As a graduate student however, two factors score in your favor: youth and ignorance. If you are a graduate student, your senior colleagues will be forgiving if you don't yet have a good overview on the literature. They know it takes time to get ones feet on the ground. However, ignorance, Howard pointed out later is generally over-hyped. I agree with him on that. You find plenty of ignorance on the web, it isn't usually helpful and particularly annoying when it ends up in my inbox. That leaves youth. Howard argues that it endows you with a "rebellious spirit," "time to be sufficiently self-indulgent/monastic," and "flexibility". I think he confused youth with not having responsibilities which isn't necessarily the same thing. That then leaves the "rebellious spirit". Frankly, I find today more rebellious spirit among the fifty-somethings than among the graduate students. But the true reason I'm saying that is of course that I'm a grim old lady now, counting my grey hairs and I'm not going to write about the advantages of youth, no way. Indeed, I read recently that creativity peaks both in the arts and sciences in the late thirties to early forties. Thus, the best years of my life are yet to come. I'm waiting. Having reached the end of my notes on Howard's talk I am pretty sure I have completely garbled up its meaning. Sorry! Let me therefore just add my own advice: You only have this one life. Don't waste your time. Be clear about what you want and don't lie to yourself about your interests, your goals, and your commitment. The discussion following Howard's talk poked around on the "fashionable topics". Most of the students in the audience seemed to be considerably less idealistic than the speaker and pointed out the need to compromise to be able to continue doing what one really loves. And they are right, it can be difficult. But it's only going to get more difficult from grad school on, so whatever you do, don't give up your dreams too easily. To measure means to count. We measure a length by counting marks on a ruler, and a time span by counting ticks of clock. We compare the quantity we want to measure to multiples of a standardised quantity, the unit of measurement, such as the metre, the inch, or the second. While in earlier times, the unit of length may have been set by the foot of the king, the French Revolution originated the metric system, with units of length, time, and mass rooted in the natural world, independent of the contingencies of human history. Nowadays, the second is defined by counting 9192631770 beats of the valence electron of an isolated cesium-133 atom flipping its spin in the magnetic field of the cesium nucleus, and the metre is the distance travelled by light in a vacuum in 1/299792458 of a second. It's just the unit of mass, the kilogram, which is still defined in an old-fashioned, 19th century style, by a prototype meticulously kept in a vault of the Pavillon de Breteuil near Paris, France. The International Prototype of the Kilogram (IPK) inside three nested bell jars at the Bureau International des Poids et Mesures (BIPM, International Bureau of Weights and Measures), Paris, France. Using a material artefact such as the Prototype as the standard of mass has a few obvious disadvantages: It is not easy to reproduce exactly, and it is even subject to tiny changes over time, for example by accumulation of contaminants on the surface, which are not completely understood. Thus, as Peter Becker and Arnold Nicolaus write in their feature article "The marathon race to an new atomic kilogram" (Europhysics News 40(1), 2009, pp 23-26), the Comité International des Poids et Mesures (CIMP, the International Committee for Weights and Measures) hopes to reach a redefinition of the kilogram by 2011, linking the unit of mass to fundamental constants of nature, in a way that is reproducible with a measurement uncertainty of the order 10−8. There are now two main roads which are being explored to reach these goals, the Watt balance and the Avogadro Project. While the Watt balance tries to link the kilogram to the Planck constant h by electro-mechanical experiments and exploiting the Josephson and quantum hall effects, the Avogadro Project aims at counting as accurate as possible the atoms in sphere of pure silicon, thus linking the unit of mass to the mass of a single silicon atom. I find the approach of the Avogadro Project very intriguing, because it is so elementary. In the current definition of the Système International, the base unit mole is linked to the kilogram: It's the amount of a substance which contains as many particles as there are carbon atoms in 12 gram of monoisotopic carbon-12. This number is the famous Avogadro constant, NA = 6.02214179(30)×1023, a huge number which is currently known with an uncertainty of 5×10−8. Now, if there was a way to reliably count the number of a atoms in a piece of matter to a higher accuracy, on could revert the relation of the mole and the kilogram: The kilogram then could be defined as the mass of a certain amount of atoms. This is the idea behind the Avogadro Project. To put this idea in practice, one fabricates spheres out of silicon single crystals, whose diameters are measured to within parts of a nanometre. From the accurately known size of the silicon crystal unit cell, one can then calculate the number of atoms in the sphere to a very high precision. If one knows the isotopic composition of the silicon, or uses highly enriched, nearly monoisotopic silicon-28, one can calculate the mass of the sphere. One of the "Silicon Avogadro Spheres" at the National Physical Laboratory (NPL), Teddington, UK. Peter Becker and Arnold Nicolaus, who are working on the Avogadro Project at the Physikalisch-Technische Bundesanstalt (PTB) in Braunschweig, the German national metrology institute, describe in their report the many complicated steps and technically challenges to be met to realise the elementary idea of the "counting of atoms". And it is a truly international project: The highly enriched silicon-28 is produced in Russia, it is grown in defect-free single crystals in Berlin, and processed to the perfect spheres by the Australian Centre for Precision Optics (ACPO). The Australian laboratory also has the means to precisely measure the size of the sphere. Finally, the surface of the sphere, which is covered by a thin film of oxide, is characterized by the British National Physical Laboratory (NPL). A "Silicon Avogadro Sphere" as seen by the Australian Centre for Precision Optics: Colour encodes the diameter of the sphere along different directions, running from 93.634370 mm (blue) to 93.634415 mm (red). From Peter Becker and Arnold Nicolaus: The marathon race to an new atomic kilogram. It is not clear yet whether the Avogadro Project can reach the accuracy requested by the International Committee for Weights and Measures, and if it can outdo the Watt balance project as the method of choice to define the kilogram. Anyway, it is a wonderfully elegant idea to define a unit of mass: Just link it to the mass of a silicon atom and count atoms. Peter Becker and Arnold Nicolaus: The marathon race to an new atomic kilogram, Europhysics News 40 (1) 2009, 23-26.